The Fairy Tale Girl looks and sounds really interesting. I bet that cover is beautiful! Sounds like you had a great time and some lovely reads to come home to. Cookies and beer??? I’m curious about that one. So many good-looking books. I’m reading The Hundred Gifts now. Sounds like you had a perfect getaway with your mom and sis. A Banquet of Consequences looks like a hefty undertaking! Glad you had a good time:) Laura Lippman’s books are such page turners and Susan Branch’s are so attractive… love her artwork. Enjoy! Glad you had a fun visit with your mother and sister. Your mailbox looks terrific. Have a great week Kathy. I loved Carrying Albert Home! Welcome back, so happy to hear the beach was once again a good time. 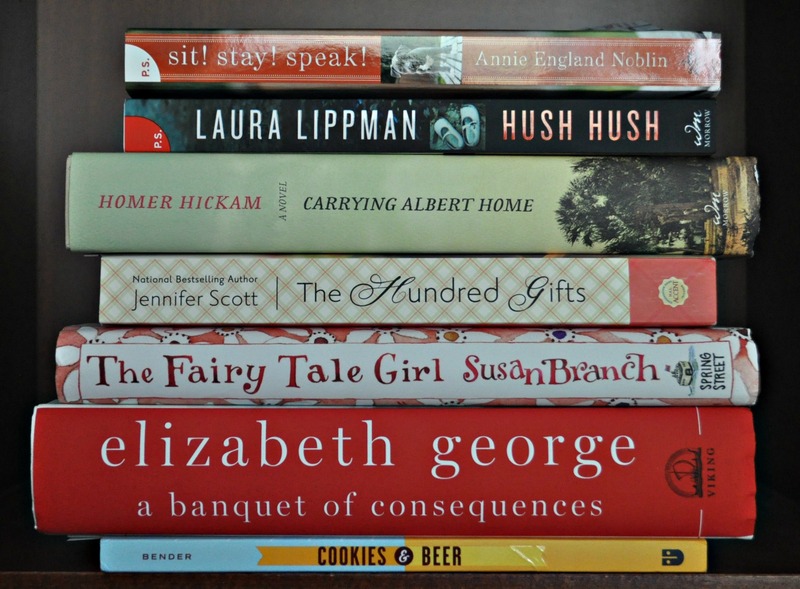 Nick book mail, I believe I have Carrying Albert Home coming, and Hush Hush is on the shelf. I loved Hush Hush…couldn’t put it down! I’m curious about The Fairy Tale Girl…thanks for visiting my blog. I read Hush, Hush and was a little disappointed. I usually LOVE her books. I guess it just depends on the person. I see Laurel loved it. ENJOY all of your books. The Hundred Gifts should be a good read. It is up next for me. I used to love Elizabeth George’s books – this new one is BIG! I have been debating about that alligator book, too…oh well…enjoy! The beach week sounds like fun. I am totally addicted to virtual jigsaw puzzles but not to real ones! I really like Laura Lippman’s novels. Hush Hush is one i want to read. Enjoy your new books, Kathy! I am glad you had a nice time at the beach! Hush Hush and A Banquet of Consequences sounds so good. I’ve wanted to try George’s books but haven’t yet. This one is huge! I really want to read The Thousand Gifts. It sounds so good and I really want to hear what you think about it. Glad you had a lovely visit with your mom and sister. I wish I lived closer to my mom. The Elizabeth George book looks like a chunkster. It sounds like you had a wonderful visit. Enjoy your new goodies, Kathy! HUSH HUSH is really good! You got some other great ones too. I’m curious about COOKIES & BEER! Yay, jigsaw puzzles are fun! You got some really good books this week. The Laura Lippman book especially looks good. Cookies and Beer! Sound perfect together. ‘The Hundred Gifts’ is already on my list, after several bloggers recieved and featured their copy last week. I still haven’t got around to reading any Laura Lippman, however ‘Hush Hush’ does sound very good and intriguing. ‘A Banquet Of Consequences’ is another must read as ‘Lynley and Havers’ are two of my favourite fictional detectives, both in writing and on the small screen. Nice pile of books! The Jennifer Scott book looks interesting. Glad you had a nice time away. Looks like a great stack of books. Enjoy! I love jigsaw puzzles but rarely do them any more. At least I have heard of three of your seven authors. 🙂 The Hundred Gifts looks good. Happy Reading! Glad you had a nice visit on the beach! The Fairy Tale Girl and Cookies and Beer caught my eye. Enjoy!